Andre Almeida is suspended after being sent off in a 5-0 defeat away to Basel in their last Champions League match. Douglas should deputise at right-back. Benfica are also expected to be without Jonas, Julio Cesar and Eliseu for the reception of Manchester United. Marcos Rojo has travelled with the Manchester United team but Jose Mourinho has confirmed he is two weeks away from returning to first-team action. 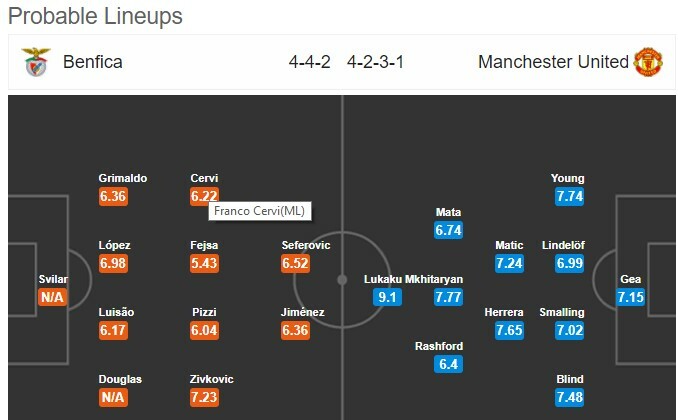 The United manager tends to rest Phil Jones and Antonio Valencia in the Champions League and that could continue here. A minor groin injury kept Eric Bailly out of United’s 0-0 draw with Liverpool on Saturday and he is still sidelined for the away side. Juan Mata, Marcus Rashford and Jesse Lingard are all pushing for recalls after starting on the bench against Liverpool. Zlatan Ibrahimovic, Michael Carrick, Paul Pogba and Marouane Fellaini are all ruled out for the away side. Benfica have lost their last 3 matches (UEFA Champions League). There have been over 2.5 goals scored in 5 of Benfica‘s last 6 games (UEFA Champions League). There have been over 2.5 goals scored in Man Utd‘s last 3games (UEFA Champions League). Benfica have conceded at least 2 goals in 5 of their last 6 matches (UEFA Champions League). Man Utd have scored at least 2 goals in their last 3 matches (UEFA Champions League). Benfica would have been earmarked as Manchester United’s hardest match before the group stages but the Portuguese giants have lost both group games this season. They have only won two of their last seven matches in all competitions. United have won nine of their opening 11 matches this season and are favourites to top Group A after winning their opening two matches. This is the second of four straight away games for Jose Mourinho’s side and how he rotates his squad will be crucial in maintaining momentum during this period. Victor Moses and N’Golo Kante are ruled out with hamstring injuries, but Alvaro Morata is in contention to return after missing their 2-1 defeat to Crystal Palace with the same injury. Meanwhile, Danny Drinkwater is still sidelined for the home side. Kostas Manolas was subbed off just after half-time in Roma’s 1-0 defeat to Napoli on Saturday and has failed to recover in time for the trip to Stamford Bridge on Wednesday. 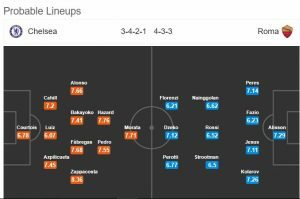 Kevin Strootman and Stephan El Shaarawy missed out against Napoli at the weekend but have been included in the travelling squad here. There have been over 2.5 goals scored in 6 of Chelsea’s last 7 games (UEFA Champions League). Chelsea have a 100% record in Group C and hold the advantage in the quest to finish top. Roma are their nearest rivals and a win over the Italian side would all but put their name in the next round of the competition. Roma are in second on four points but now have two tricky fixtures against Chelsea. Assuming Atletico Madrid can beat minnows Qarabag twice, the Serie A side will do well to hold onto second place by matchday 5.